New Trend: Neloith Sintered Stone – Upton & Co. In our Lewiston Blanc entry for the 2018 Triangle Parade of Homes, Upton & Co. featured a new countertop material. Neolith Sintered Stone is man-made and highly durable. There are limitless applications for this product including countertops, flooring, cladding, façades and furniture. 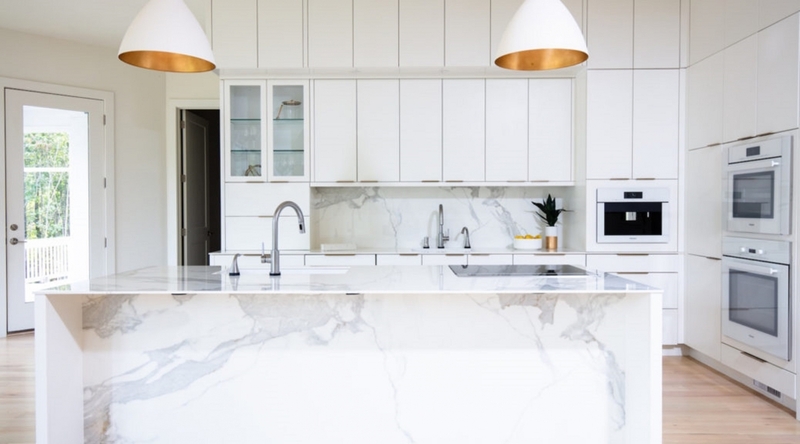 The modern kitchen in this Montvale beauty provided the perfect backdrop to showcase the polished “Statuario” variety of this stone. ROCKin’teriors, theTriangle’s first certified fabricator of the highly durable sintered stone, was responsible for the fabrication and install. Additionally, this woman-owned company, was named Fabricator of the year by the International Surface Fabricators Association (ISFA). As a preferred custom home builder, we know the importance of monitoring the trends and believe in offering top notch products to our clients. Our Upton & Co. team is happy to help educate you on this product if you’re looking for the newest trend in stone!